After the last Louisiana governor’s race centered on prostitution allegations and questions of honesty and morality, voters might have hoped the competition for the job four years later would be slightly nicer. They’ll get no such thing. Eight months ahead of the Oct. 12 primary, the name-calling and trash-talking has already started, in press releases and emails, on social media sites and in digital advertising. The three announced contenders—and the teams supporting them—so far seem more focused on attacking opponents than asserting their own visions for Louisiana’s future. Incumbent John Bel Edwards is seeking a second term as the Deep South’s lone Democratic governor, after a 2015 election victory in which he defeated then-U.S. Sen. David Vitter, who was damaged by a prostitution scandal and dislike within his own party. 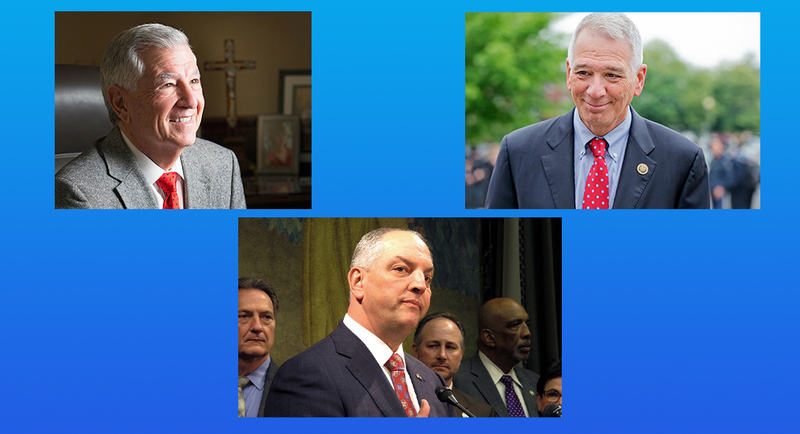 Two Republicans have announced they’re running against Edwards: U.S. Rep. Ralph Abraham, a doctor from rural northeast Louisiana in his third term in Congress; and Baton Rouge businessman Eddie Rispone, a first-time office-seeker and long-time GOP political donor. The three men, their campaigns and their supporters have hit each other early and often, suggesting voters should steel themselves for mudslinging the rest of the year. For Republicans, an attack-heavy strategy is the most obvious choice since they’re running against an incumbent and trying to explain to voters why they should dump him for someone new. For Edwards, he wants the first thing voters hear about two relatively unknown GOP contenders to spark negative associations that linger all the way into the polling booth. Abraham’s taken the most hits so far from the pro-Edwards camp. They’ve said Abraham reneged on a promise to donate his congressional salary to charity, after Abraham spokesman Cole Avery said the congressman gave the money to charitable organizations during his first term but started pocketing his salary in his second term. They’ve also slammed the Republican congressman for missing multiple votes, including during the partial government shutdown, to attend fundraisers for his gubernatorial campaign. Edwards and his supporters haven’t ignored Rispone, chastising him in particular for his ardent support of former Gov. Bobby Jindal, who left office deeply unpopular. Rispone, meanwhile, slams Edwards in most fundraising emails his campaign sends out to potential donors. He reminds voters that Edwards voted for Hillary Clinton in the last presidential race. And he regularly links Edwards, a moderate who opposes abortion and supports gun rights, to more liberal national Democrats, hoping to undermine him in a state that solidly supported Donald Trump. “Out-of-state liberals are lining up to defend Democratic governor John Bel Edwards in Louisiana. He’s running around the state boasting about his war chest that is bankrolled by the same northern elites who are helping Nancy Pelosi impose her liberal agenda,” a recent Rispone fundraising email said. Read the full story.